Today’s Outside the Box is a report that most of you have read about or seen quoted but have never actually seen directly. It is the National Federation of Independent Businesses (NFIB) Small Business Economic Trends monthly report, which they have done since 1973. It was at first a quarterly and then switched to a monthly in 1985. It is thus a continuous record of the ups and downs of small business trends and moods, and is a great barometer of the economy. The man in charge of the index, my good friend Dr. William (Dunk) Dunkelberg, has been doing this seemingly forever and is a font of knowledge about small business. The report itself is straightforward and not very long, and I go through it every month. You can get a feel over time of how things are changing. For instance, right now the number one problem for small businesses is finding employees with the right skills that they need for their jobs. That jives with the findings of other big business surveys and other data that talks about a massive skills mismatch between those who are looking for jobs and those who want to find employees. My friend John Burns, who is one of the finest analysts of housing and new home construction in the country, talks about how many new homebuilders are seriously hampered from expanding because of how hard it is to get skilled labor. The problem is, much of their skilled labor has gone back south of the border, and the allure of being a carpenter or working in one of the associated trades dosn’t seem to capture the imagination of many young people today. And of course, there is a matter of training. John points out that carpenters and related tradespeople are making less than they did in 1973 on an inflation-adjusted basis, and has told employers that if they want to find people they’re going to have to start raising their pay. Which is not exactly what they want to do, given the low margins in the homebuilding business already. What to do, what to do? Anyway, today’s report, all in all, is pretty upbeat. Fifty-nine percent of small businesses are trying to hire workers, although 88% of those businesses said that there were few or no qualified applicants for the positions they were trying to fill. I think we need to start experimenting with government apprenticeship programs rather than continuing to focus on all of the classroom training. It would certainly be more practical and actually cost less money. 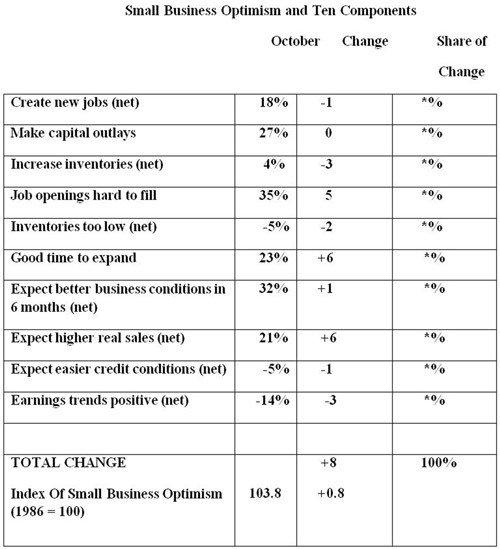 The Index of Small Business Optimism gained 0.8 points to 103.8 in October, maintaining a streak of robust readings. Four of the 10 Index components posted a gain, 5 declined and one was unchanged. Labor market indicators point to continued good jobs reports, as reports of actual employment gains for October posted solid numbers and reports of job openings surged to record territory. Reports of increased compensation remained strong, the incidence of reported price increases rose a bit, good news for the Fed which wants more inflation. Plans to spend on inventory and capital projects didn’t advance but held at solid levels. Owners became much more optimistic about the environment for expansion, which implies a more positive longer-run view. In the nearer term, they are more optimistic about real sales growth and improved business conditions through the end of the year. The net percent of owners reporting positive sales trends did not improve but did remain positive. Overall, the NFIB owners are in synch with the improving economy, although the 3 percent growth figure overstated the strength of domestic spending thanks to strong inventory growth (we paid to make it but didn’t sell it yet) and stronger exports. 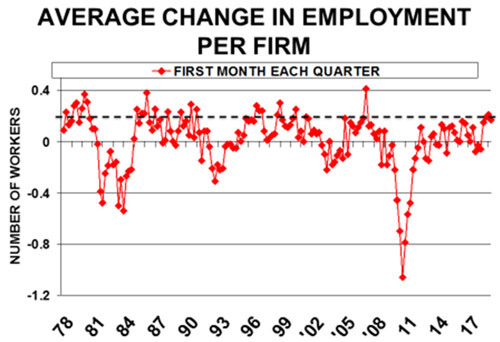 Job creation strengthened in the small business sector as business owners reported a seasonally adjusted average employment change per firm of 0.17 workers. Fourteen percent (up 2 points) reported increasing employment an average of 3.5 workers per firm and 11 percent (down 2 points) reported reducing employment an average of 2.2 workers per firm (seasonally adjusted). Twenty percent of Florida/Georgia respondents reported increasing employment and fifteen percent in Texas (not seasonally adjusted, small sample size), both above the sample average as expected. Fifty-nine percent reported hiring or trying to hire (up 2 points), but 52 percent (88 percent of those hiring or trying to hire) reported few or no qualified applicants for the positions they were trying to fill. Twenty percent of owners cited the difficulty of finding qualified workers as their Single Most Important Business Problem (up 1 point), second only to taxes and the highest reading since 2000. This is the top ranked problem for those in construction (31 percent) and manufacturing (27 percent), getting more votes than taxes and the cost of regulations. 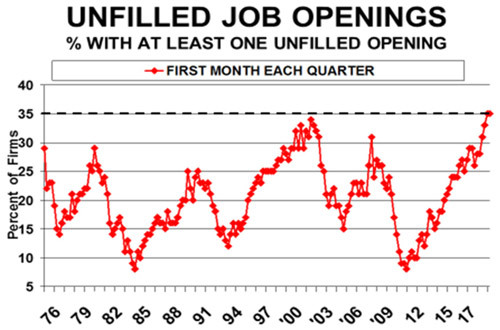 Thirty-five percent of all owners reported job openings they could not fill in the current period, up 5 points and at record-high levels. Fourteen percent reported using temporary workers, up 3 points. Reports of job openings were most frequent in construction (49 percent), manufacturing (48 percent) and non-professional services (30 percent). Forty-two percent of Florida respondents reported unfilled job openings (not seasonally adjusted, small sample) as might be expected. Irma’s path of destruction covered the entire state adding substantially to the demand for labor. 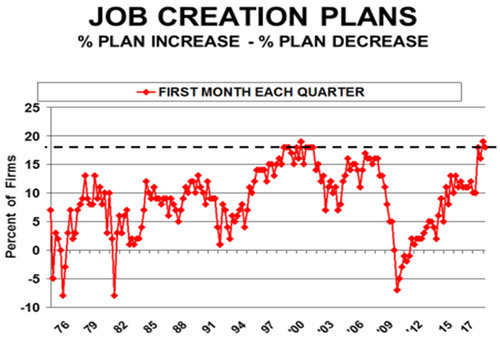 A seasonally adjusted net 18 percent plan to create new jobs, down 1 point from September’s strong reading. Not seasonally adjusted, 19 percent plan to increase employment at their firm (down 1 point), and 7 percent plan reductions (up 1 point). Hiring plans were strongest in construction (22 percent), manufacturing (25 percent) and the wholesale trades (27 percent). With labor shortages already constraining the construction of new homes, finding labor for reconstruction in Texas, Florida, Puerto Rico and the Virgin Islands is problematic. Fifty-nine percent reported capital outlays, unchanged. Of those making expenditures, 41 percent reported spending on new equipment (up 2 points), 24 percent acquired vehicles (up 1 point), and 16 percent improved or expanded facilities (up 3 points). Seven percent acquired new buildings or land for expansion (up 1 point) and 12 percent spent money for new fixtures and furniture (unchanged). The percent of owners planning capital outlays was unchanged at 27 percent. The recovery from the hurricanes will undoubtedly raise these numbers. Plans were most frequent in construction (27), professional services (34 percent), the wholesale trades (31 percent), and manufacturing (38 percent). The net percent of all owners (seasonally adjusted) reporting higher nominal sales in the past three months compared to the prior three months was a net 1 percent, unchanged from September. Consumer spending slowed at the end of the third quarter and hurricanes definitely depressed shopping in large parts of the country. Recovery activities should add some energy to sales in the fourth quarter, especially vehicles and home improvement. Seasonally adjusted, the net percent of owners expecting higher real sales volumes lost 12 points, falling to a net 15 percent of owners, this after large gains in July and August. What triggered such a large decline in expectations is less clear, as reports on the economy (e.g. 3.1 percent GDP growth in the second quarter etc.) were fairly good. Respondents in Florida and Texas were no less optimistic than their counterparts in the rest of the country. The net percent of owners reporting inventory increases rose 2 points to a net 0 percent (seasonally adjusted). Inventory building did occur for the economy as a whole, but in the form of reduced rates of depletion in the small business sector. The net percent of owners viewing current inventory stocks as “too low” lost 2 points to a net negative 5 percent, a less positive view of the need for current stocks. This is a bit surprising in light of the rather positive view of real sales trends in the next 3 months. The net percent of owners planning to add to inventory fell 3 points to a net 4 percent, a solid figure that is supportive of fourth quarter growth. The net percent of owners raising average selling prices rose 2 points to a net 8 percent. Clearly, inflation is not “breaking out” across the country as the Federal Reserve hoped. Ten percent of owners reported reducing their average selling prices in the past three months (unchanged), and 16 percent reported price increases (up 1 point), illustrative of the dynamics of price adjustments in the private sector to changes in economic conditions and demand. Seasonally adjusted, a net 22 percent plan price hikes (up 3 points), although far fewer will report actually doing so in the following months. The Federal Reserve has operated with a view that rising wages (or labor costs) will always produce inflation. Although there is a positive correlation between labor cost increases and price increases, it is not perfect, indicating that there are other intervening factors that shape just how quickly labor costs are passed on to customers in higher prices. Reports of higher worker compensation rose points to a net 27 percent, historically strong. The Federal Reserve is hoping this will result in inflation as owners pass these costs on in the form of higher selling prices, but to date, their wish has not been granted to any significant degree. Owners complain at record rates of labor quality issues, with 88 percent of those hiring or trying to hire reporting few or no qualified applicants for their open positions. A near-record 20 percent selected “finding qualified labor” as their top business problem, far more than cite weak sales or the cost of regulations as their top challenge. Plans to raise compensation rose 3 points in frequency to a net 21 percent, following a 3 point rise in September. Gains in compensation are to be expected when labor markets are very tight as they appear to be. The frequency of reports of improved profit trends deteriorated 3 points to a net negative 14 percent reporting quarter on quarter profit improvements, not great but historically OK.
Four percent of owners reported that all their borrowing needs were not satisfied, up 2 points and historically low. Twenty-nine percent reported all credit needs met (down 4 point) and 53 percent said they were not interested in a loan, up 2 points. Only 2 percent reported that financing was their top business problem compared to 21 percent citing taxes, 14 percent citing regulations and red tape, and 20 percent the availability of qualified labor. Weak sales garnered 10 percent of the vote. In short, credit availability and cost is not an issue and hasn’t been for many years. Thirty percent of all owners reported borrowing on a regular basis (up 1 point). The average rate paid on short maturity loans was up 40 basis points at 6.0 percent, little changed even as the Federal Reserve has been raising rates. Overall, loan demand remains historically weak, even with cheap money. Small businesses have been restructuring over the past ten years, profit trends have been historically good, and owners are in a good position to borrow once they have a good reason to do so. The preliminary estimate of third quarter growth came in at 3 percent, but this figure will be revised several times before the “official” figure is reported. It was virtually unchanged from the 3.1 percent growth for the second quarter. Domestic spending was weaker, closer to a 2 percent rate of growth. Residential spending faltered a bit, perhaps due to supply constraints (labor), not weaker demand. The Fed will boost rates again in December, but that will leave the Federal Funds rate at about half of the level that history would suggest. The Fed is still in control of rates and bond investors bet on the Fed, not markets. The world’s economic system has been through a lot in recent years — from the challenge of the financial crisis to income inequality, the pressures of immigration, changing technologies and geographic shifts in production, to name a few. In this opinion piece, Kalin Anev Janse, secretary general and a member of the management board of the European Stability Mechanism (the eurozone’s lender of last resort), considers five major challenges and why international organizations offer the best hope for managing them. A year ago, we were shaken by geopolitical shifts with unpredictable ripple effects. The situation looks no more stable today. The Brexit vote and the U.S. presidential election outcome signal dramatic changes in cooperation globally and a push for more protectionism. In practice, these votes called into question the multilateral institutions and international collaboration among countries that embody that cooperation. In autumn 2017, we gathered together a group of senior officials from the 13 largest international organizations to try to crack these problems. Exactly 10 years ago, in 2007, the first signs of the Great Recession emerged. By 2008, the U.S.-led subprime crisis evolved into a global financial crisis. By 2010, Europe had become engulfed in its own crisis, throwing financial markets into turmoil and several sovereigns into a downward spiral of debt and banking crises. Despite the current ongoing recovery, and the successful economic rebound both in North America and Europe, worrying trends became apparent in 2016. Some major players demonstrated a reduced commitment to multilateral cooperation, criticism of open and free trade, and fading interest in climate change. This new landscape increased uncertainty and poses a threat to more buoyant macroeconomic and financial fundamentals. It also puts a strain on relations between major players internationally, as well as between citizens domestically. In countries like the U.S. and the UK, it abruptly split societies in half and threatened a reverse of seven decades of international cooperation. All these elements are putting pressure on international organizations as well. International organizations are increasingly called upon to redefine their role to ensure that their programs and activities are still relevant in this evolving political and macroeconomic landscape. They are also pushed to show how they add value to citizens’ lives. At the same time, they need to maintain lean structures to minimize the burden on taxpayers, and enhance efficiency and effectiveness of their activities. So, what has changed? There are five trend shifts globally that by their nature call for international cooperation, but they have been underestimated, undervalued and under-addressed both nationally and internationally. The results shook our world with an unforeseeable force. People have an age-old tendency to compare themselves to their neighbors, especially when it comes to wealth. We are less concerned about our absolute level of wealth, but look more at what we have and own in relative terms to the people around us. Global private wealth reached a record $166.5 trillion in 2016, an increase of 5.3% over the previous year, according to a report by the Boston Consulting Group (BCG).1 In 2015, the increase was 4.4%. Faster economic growth and stock price performance mainly drove the rapid increase. But this growth is not spread equally. Private wealth in Asia-Pacific is likely to surpass that of Western Europe by as early as the end of this year, BCG’s analysis shows. This could be an economic shock for many citizens of traditional western powerhouses. Such changes need to be watched and managed carefully as they tilt economic and political power. British geographer and politician Sir Halford Mackinder used to say: “Unequal growth among nations tends to produce a hegemonic world war about every 100 years.” We can only hope he is wrong. Inequality is getting ever worse. A tipping point was reached in 2015, when the richest 1% in the world owned as much as the rest of humanity. This trend has continued and further accelerated. Just eight men now own the same wealth as 3.6 billion people globally, more than half of humanity, according to a January 2017 Oxfam report. Income inequality is on the rise as the affluent continue to accumulate wealth, often at the expense of the poorer. Richard Reeves points out in his book Dream Hoarders, that we shouldn’t only be worried about the top 1% or 0.01%. More importantly, in some countries, like the U.S., there is a widening gap in society between the upper middle class and everyone else. (Reeves defines the upper middle class as those whose incomes are in the top 20% of U.S. society.) These growing disparities are reflected in family structure, neighborhoods, attitudes and lifestyle. The top income earners are becoming more effective at passing on their status to their children, thus reducing overall social mobility and increasing social divisions, along class as well as income lines. And all this has an interesting twist: the inequality paradox. 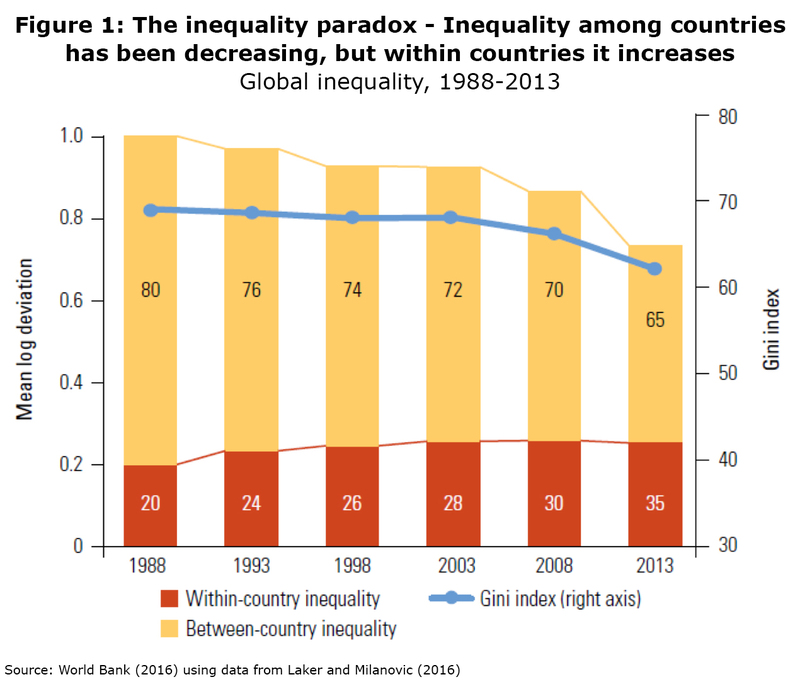 Despite the progress in reducing global poverty and reduction of inequality among countries since 1980s, income inequality within countries has been rising. These days, almost one-third of global inequality is attributable to in-country inequality (figure 1), making clear why many voters across the western world feel as they do. How disruptive will the effect of globalization and technological advances be on labor markets? That is a key question today. Over the last three decades, advanced economies have seen labor-intensive sector jobs move to emerging markets. In other cases, new technologies have made certain occupations obsolete. UNCTAD (United Nations Conference on Trade and Development) released a policy brief last year that said robots could take away two-thirds of jobs in developing countries. We see some of these shifts already. Today’s five largest global companies are: Apple, Alphabet (Google), Microsoft, Amazon, and Facebook. They employ around 720,000 people. 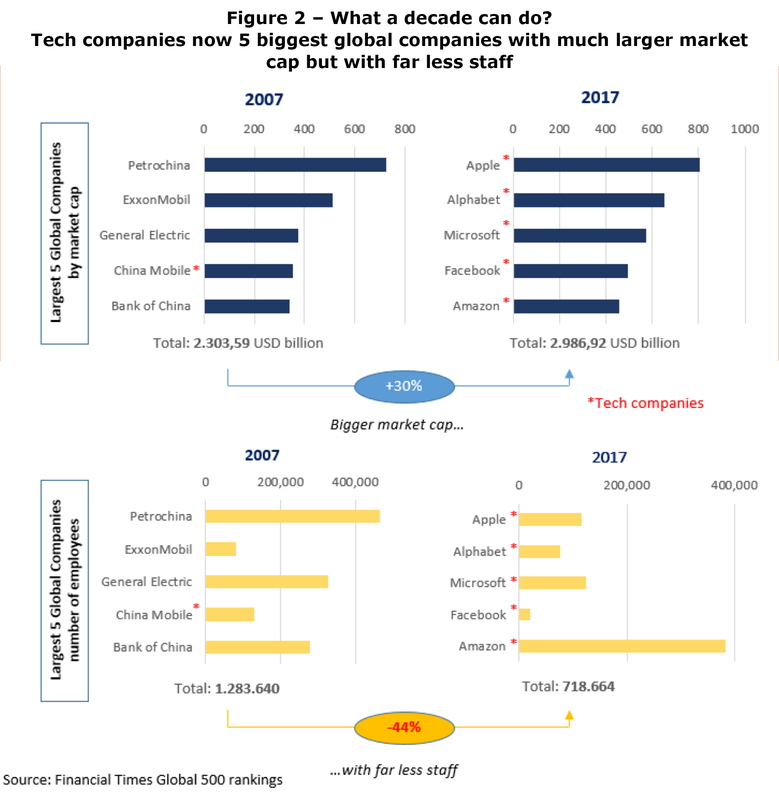 A decade ago, the big five were completely different: Petrochina, Exxon Mobile, General Electric, China Mobile, and Bank of China. They employed around 1.3 million people. What a decade can do! Today’s five biggest companies are all technology companies. Their market capitalization is 30% higher than that of the top five a decade ago; they achieve that with a whopping 44% less staff (figure 2). 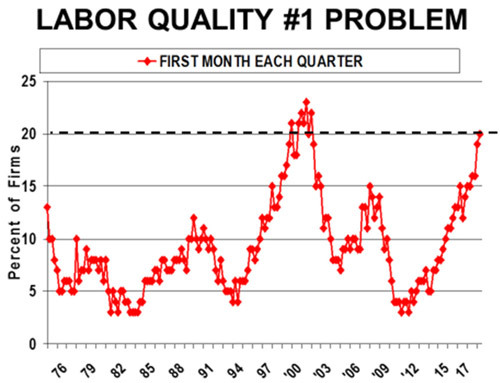 This has a large impact on labor markets and jobs. Does this alter work preferences? Yes, and this is best assessed by looking at the two most dynamic groups of (future) job seekers: millennials and today’s teenagers. They feel that they are receiving conflicting messages from employers and career advisors: On the one hand, they are told that robots are bound to replace future jobs; on the other, they need technical skills to compete in the job market. Caught in this conundrum, they are trying to create new types of jobs, rather than going for traditional ones such as banking, finance, or accounting. They dream of becoming YouTube stars, famous videogame vloggers, or Instagram travel bloggers who are paid by sponsors to visit hotels and restaurants around the world and generate sufficient number of likes. New creative companies pop up even in professions that well-educated young people ignored for many decades. Old merchants’ jobs have been revived, from organic bakers to cool rural wine-makers and hipster butchers. I am less concerned about the imaginative young generation; they will find their way. It is the group of middle-to-older, middle-to-lower-skilled workers where issues might arise. A recent McKinsey estimate shows that 45% of the global working age population is underutilized, either unemployed or underemployed. Unless there is a redirection of investment into labor-intensive productive sectors and retraining, the desired job creation may not happen, fueling unhappiness, unrest and populism. G20 countries have become more protectionist. 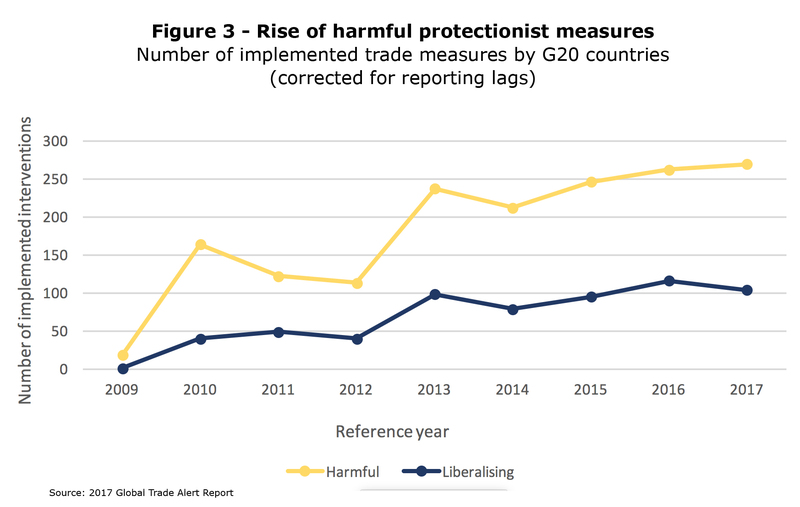 The total number of discriminatory protectionist measures implemented by G20 countries has increased over the past five years (figure 3). The main driver has been the U.S. According to the Global Trade Alert report, had the United States been excluded, the total number of protectionist policy instruments imposed by the G20 would have been lower in 2017 than in 2016. 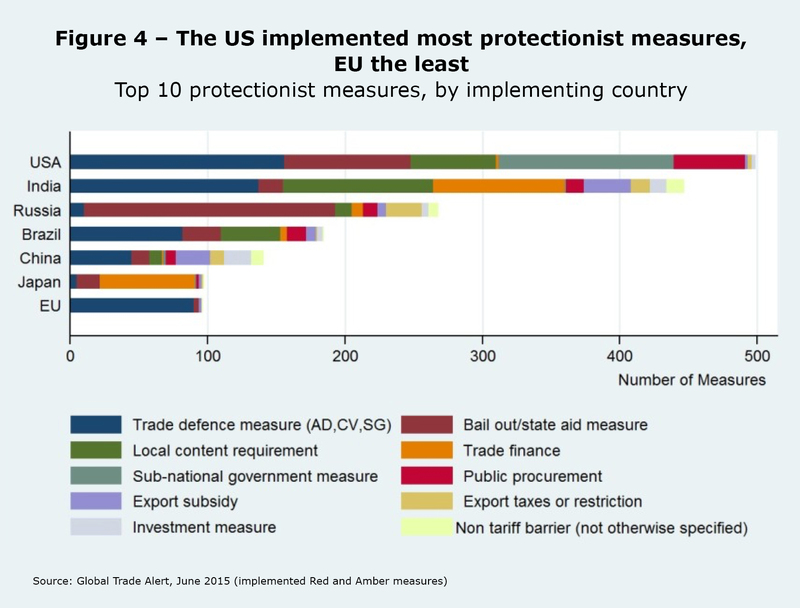 The U.S. has implemented the most protectionist and trade restrictive measures of its peer group, the European Union the least (figure 4). This sounds counter-intuitive for the country that prides itself as an open economy, but it seems that it is Europe that is championing trade barrier reductions and the avoidance of protectionist measures. The recent refugee crisis in Syria and the resulting arrival of more than one million migrants in 2015-2016 in Germany presented a formidable challenge to political and social stability. 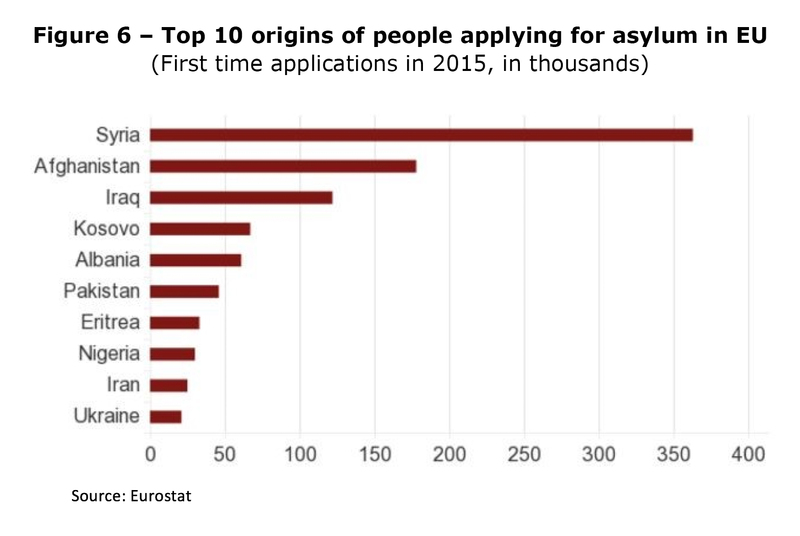 In addition to tougher checks on the EU’s external borders, and a controversial refugee pact with Turkey, the EU is investing more in the migrants’ countries of origin. The refugees from Syria have been fleeing a brutal civil war. They are escaping violence, as many also are from Iraq and Afghanistan, and, in such cases, humanitarian reasons should always prevail over other considerations. Wars, climate change, and broader economic and social inequalities are the root causes of migration flows. 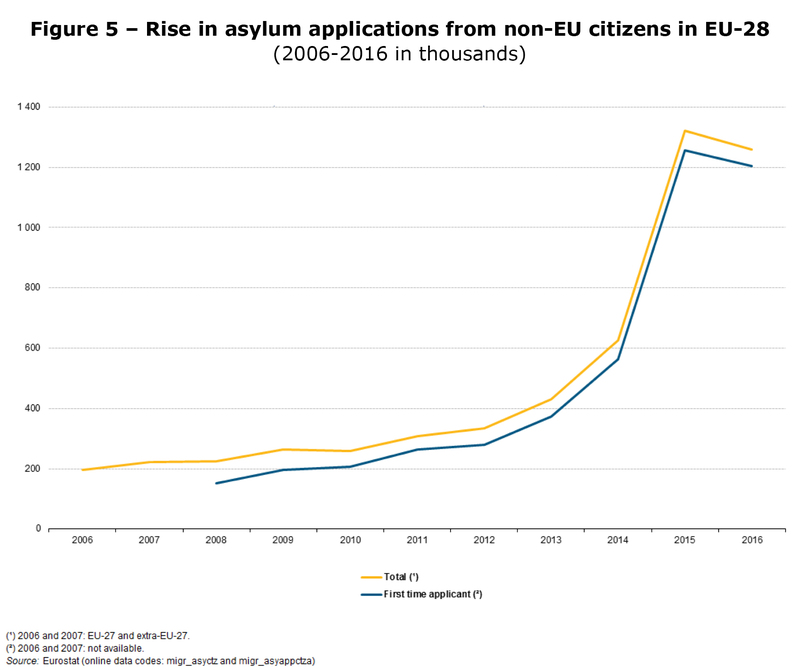 While these increases in migration are all easy to understand, they nonetheless cause issues in the countries of arrival: integration problems, absorption limits and skills-mismatches. Social media pose the final major challenge to international organizations. According to a recent analysis by the Reuters Institute for the Study of Journalism, 51% of people with online access use social media as a news source. 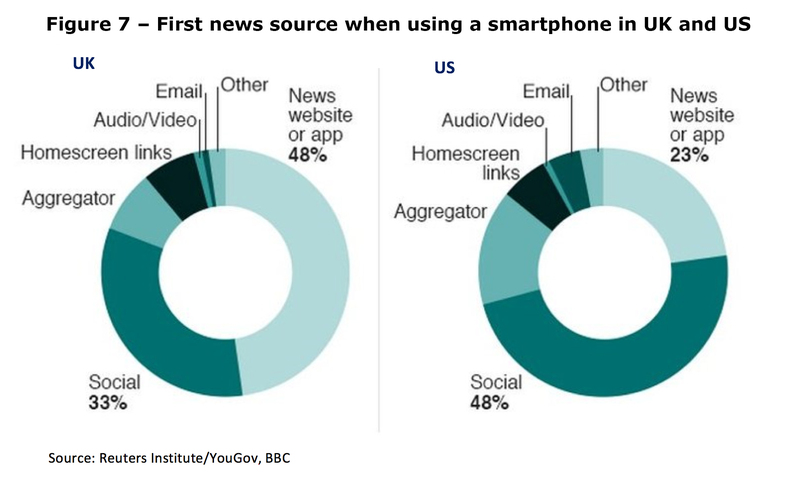 Social media is the primary source for news for 44% of smartphone users in the U.S. and 38% in the U.K. (figure 7). Coupled with the proliferation of so-called fake news, which became so prominent in last year’s U.S. elections, as well as social media’s favoring of ever shorter and catchier messages, it is no wonder that many observers are saying we are living in a post-truth world. 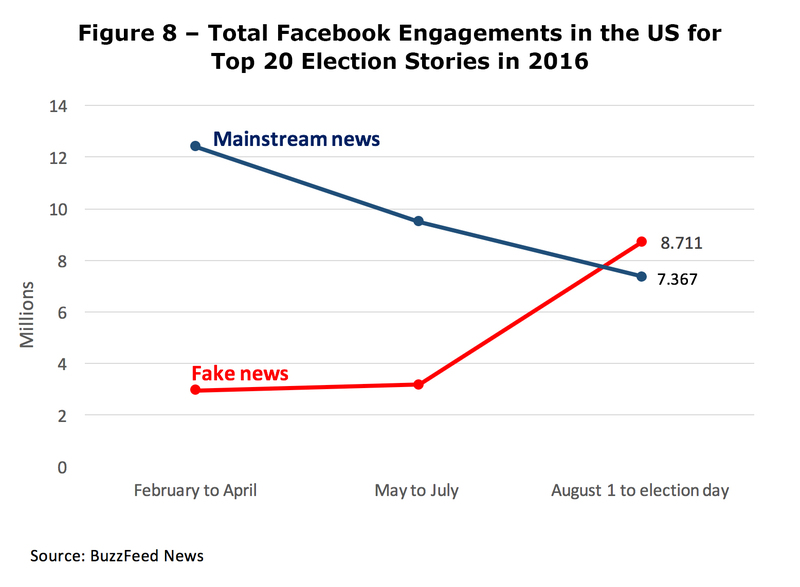 A recent BuzzFeed analysis of social media traffic in the run-up to the November 2016 U.S. elections found that top fake election news stories generated more total engagement on Facebook than the top election stories from the 19 major news outlets combined (figure 8). These trends represent serious tests on many fronts, including combating terrorism and securing the proper functioning of democratic institutions. Fear, anger and despair enlist recruits for terrorism. They also create a more polarized social climate and the rise of extremism, as we were recently reminded by the tragic events in Charlottesville in the U.S. or by some half a dozen car terror attacks in Europe this year. Is Peaceful International Collaboration Ending? Despite these daunting challenges, there are also reasons to be optimistic. At the European level, political leaders have regained faith in sticking together to address global and societal realities. At least two factors have been crucial to the recovery of confidence in the European project. First, the EU is delivering economically. The euro area and the broader EU recently recorded their highest ever employment levels. Investment is up, and growth is projected to be on a par with, if not higher than, growth in the U.S. this year. Second, despite growing populism, Europe’s citizens have confidently stood for democracy, open borders, economic reforms, and more Europe. The results of the elections in the Netherlands and France bore witness to this positive trend among European societies. In spite of the recent electoral gains of an extreme right-wing party in Germany, the election outcome was again clearly pro-European. The continent appears in better shape today than it did after Brexit one year ago. In my view, Europe can offer lessons in regional integration that are relevant for other parts of the world. Among others, my institution – the European Stability Mechanism (ESM) – is a product of European cooperation in response to the financial and economic crisis. As the largest and most active regional financing arrangement, the ESM works closely with its peers in other regions of the world. Beyond Europe, the continued rise of Asian economies, as well as those in Latin America, present new opportunities for strengthening international cooperation in many of the areas I have mentioned, including finance, infrastructure, energy, education, climate change and others. So what does this all mean for public international organizations? These organizations act as agents of their shareholders (i.e., member states) and are called upon to help address difficult challenges. Some international organizations that raise funds in the capital markets for their operations, like mine, also have to be attuned to the concerns of their investors. In general, international organizations also dispose of soft power, derived from funds and moral suasion based on extensive experience, as well as the values and norms that they adhere to and champion. Obviously, international organizations also need a broad-based buy-in from the public at large, in particular in times of change and uncertainty. All this needs to be done while maintaining lean organizational structures to keep the costs for taxpayers low. In our autumn 2017 session of the group of senior officials from international organizations, we pushed ourselves to find modern ways to explain better what we do and what we can offer when it comes to tackling these challenges. Among other matters, we discussed using more social media and empowering our talented and hard-working staff to share their personal stories, because it can best demonstrate the tremendous impact of their work. We also need to make our institutions less bureaucratic and truly “lean, clean and green,” not only because it is more efficient but also because it can help us attract more talent among the millennial generation. And finally, we need to work even harder to better cooperate with each other and to ensure the missions and activities of our institutions make a difference, because nothing can demonstrate the value of multilateralism better than international organizations delivering effective and sustainable solutions to the most pressing global challenges. But at the end there is only one question that matters: Is there any alternative way to making our world with more than 7 billion people work? Not at this stage – multilateral institutions and international organizations have proven to be the most effective way to solve complex global problems in a peaceful and constructive way. All other alternatives involve far more violence, aggression and isolation. If we look through the eyes of our children, it is much wiser to collaborate and work together rather than fight (digitally) with our global neighbors, whether close by or far away. “Global Wealth 2017: Transforming the Client Experience,” published in June 2017. The GOP tax proposal cuts corporate taxes and eliminates key individual deductions. But we’re a long way from a final bill. Neither a borrower nor a lender be, Polonius famously counseled. Uncle Sam, who has long subsidized borrowing and lending, may be coming around to that point of view. The tax bill introduced last week by Republicans in the House of Representatives has plenty of cuts in rates, but fewer reforms. As for simplification, a 429-page document hardly qualifies as simple. And far from putting tax preparers out of business, the proposal will keep lobbyists and tax lawyers extra busy, as the House attempts mightily to meet the Thanksgiving deadline imposed by President Donald Trump to produce a bill to send to the Senate. The World’s Greatest Deliberative Body—at least in the opinion of a select group of 100 men and women—is then supposed to pass tax legislation by Christmas. Even if such a miracle does come to pass, there are certain to be lots of changes in the legislation by the time the stockings are hung by the chimney with care. 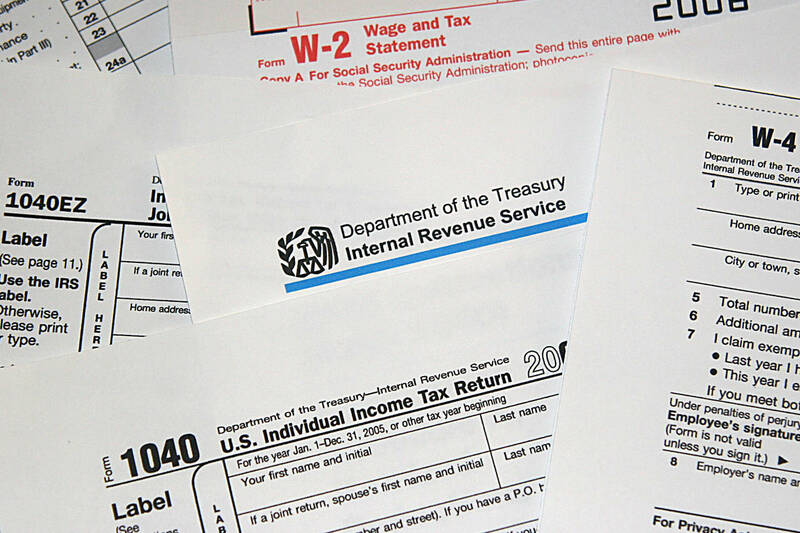 The proposals at this point, as John Kimelman and Karen Hube outline, concern mainly a reduction in the corporate tax rate, to 20% from the current statutory 35%, plus a lowering of personal tax rates, which are paid for by the elimination of—or reductions in—various deductions and other breaks. Prominent among those—and of key importance to investors—are the scuttling or curbing of incentives to borrow that are buried deep into the tax code. Perhaps most noticed is the halving of the size of home mortgages that qualify for interest deductibility, to $500,000 from $1 million. Under the new ceiling, the most expensive house that would get full deductibility would go for $625,000, assuming a 20% down payment and an 80% loan-to-value ratio, the kind of safe and sane loan that once again has become common after the subprime debacle that precipitated the financial crisis. That’s more than the national median, but way below what houses cost in pricey places on the coasts. Mortgages are the biggest part of the credit market, but at this point, the impact of tax changes is imponderable. The uncertainty of the timing and magnitude of cash flows from mortgages is what makes the sector so difficult, and what attracts so-called rocket scientists in advanced mathematics to model how the loans will get paid off, which depends on whether homeowners decide to refinance or move. Under the tax proposals, current homeowners are grandfathered in and can continue to deduct interest on mortgages up to the old $1 million cap. Plus they will be allowed to refinance and keep up to a $1 million deductible loan. But the proposed measure would eliminate the mortgage deduction for second homes. Baby boomers would then ask the musical question from the Clash: Should I stay or should I go? Another big part of the tax plan is the elimination of the federal deduction for state and local taxes, with an exclusion for $10,000 in property taxes. In states with high taxes and high house prices, that’s a massive hit to the upper-middle class. Once the kids are out of school, parents may be even more likely to flee to more salubrious places, in terms of climate, housing costs, and taxes. All else being equal, that will reduce the size of the mortgage market over time. That is, if the changes come to pass—the real estate lobby will fight them tooth and nail. Nevertheless, a shrinkage of demand from the biggest sector of the credit market ought to exert downward pressure on interest rates. The bill also would take away incentives for corporations to go into hock. At a lower tax rate, the dollar value of interest deductions falls, so the after-tax cost to borrow would be higher. Given historically low interest rates and a 20% tax rate, corporations would still have access to really cheap money, which they could tap for share repurchases. But there are other, more specific disincentives to corporate borrowing. In effect, the proposed legislation would limit net interest deductibility to 30% of earnings before interest, taxes, depreciation, and amortization (Ebitda), Goldman Sachs economist Alec Phillips writes in a client note. Regulated utilities and the real estate sector would be exempt, however. Among the large companies in the Standard & Poor’s 500 index, few would be affected by such a limit. According to Morgan Stanley economists, less than 4% with an investment-grade credit rating would bump up against this ceiling. “However, about one-third of the high-yield universe would see interest deductibility capped, and for those levered credits, this change is a headwind, especially with no grandfathering of existing debt,” they write. In addition, the Morgan Stanley crew continues, when times are tough and Ebitda falls, speculative-grade companies won’t be able to take deductions for interest expense. Think back a couple of years when oil prices crashed and levered energy outfits were caught in a vise of falling revenue and high interest costs. Losing the tax benefit would exacerbate such a squeeze. Repatriation of foreign profits also will curb borrowing, since companies could bring money home to give to shareholders in dividends and buybacks, rather than issuing bonds, according to Bank of America Merrill Lynch economists. However, they add, that might be offset by increased merger-and-acquisition activity once uncertainties revolving around tax reform are lifted. Finally, the tax bill would curb borrowing in the municipal-bond market. While the exemption on interest on most types of muni bonds would be retained, so-called private-purpose bonds would lose that privilege. In particular, bonds to finance sports stadiums no longer would qualify for tax-exempt bond financing, This will mean billionaire owners of sports teams would have to build their stadia with private, taxable money, and that “should keep municipalities from being on the hook for bad stadium deals,” according to John R. Mousseau, director of fixed income at Cumberland Advisors. Tax-exempt financing for nonprofit hospitals and private universities also would be ended, along with “advance refunding” bonds. The latter provision would hurt municipalities. They’ve saved billions of dollars by reducing borrowing costs with these financings, Mousseau notes. He thinks this provision will be killed, given that it hits municipalities while they cope with pension expenses. On the other hand, Washington needs the bucks to keep the tax bill’s cost under $1.5 trillion, while providing cuts to corporations. Ultimately, he sees the elimination of deductions for state and local income taxes boosting in-state demand for bonds exempt from those levies. But there also will be pressure to roll back state taxes in high-tax states. At the same time, residents of high-tax states such as New York, New Jersey, Massachusetts, and California will step up their exodus to lower-tax states, such as Nevada, Texas, and Florida, Mousseau concludes. That would erode the tax base of high-tax states and localities, which supports general-obligation muni debt. In all, the proposed changes could have huge but unknown effects on the American way of borrowing. During the tax-reform push three decades ago, the saying was that the bill was being written on a word processor, then the state of the art in computing, which allowed continuous revision. This campaign is just beginning and everything is subject to change. WHILE THE TAX PACKAGE contained some surprises, President Trump’s nomination of Jerome Powell as Federal Reserve chair to succeed Janet Yellen was exactly what was expected. Ditto the Federal Open Market Committee’s decision to keep short-term interest rates unchanged at its meeting last week, while also indicating that another quarter-point increase is all but certain in December. Powell is likely to maintain the predictable path set out by his predecessor, which undoubtedly was a major point in his favor for the White House (along with being a Republican, as opposed to Yellen, a Democrat). Assuming she departs from the Fed’s Board when her term as chair ends in February, Trump would have four more seats to fill, giving him the chance to recast the central bank. No need to rock the boat now, given the stock market’s ending the week at records for the Dow Jones Industrial Average, the S&P 500, and the Nasdaq Composite. Meanwhile, the economy continues to chug along, with unemployment dropping to 4.1% in October, the lowest level since December 2000. Things clearly ain’t broken at the Fed, so there’s no need to fix things (other than party affiliation). That said, the latest jobs report was less stellar than the headlines, notwithstanding a 261,000 jump in nonfarm payrolls. That was short of the 300,000 rise forecast after September’s hurricane-hit tally, which was revised to a gain of 18,000 from a drop of 33,000. But average hourly earnings were unchanged in October, after an aberrant upward blip of 0.5% in September, when low-paid workers couldn’t get to work because of the storms. As for the drop in the headline jobless rate, that mainly reflected a 765,000 plunge in the labor force, bringing the participation rate down sharply to 62.7% of the adult population, from 63.1% in September. The question before the Powell Fed will be whether the U.S. economy is at full employment and needs significantly higher interest rates. After the expected December rate hike, the fed-funds futures market sees only one more increase in 2018, while the FOMC’s dot plots imply three rises next year. The issue will be whether the labor market or the stock market counts more for the new central bank leadership. In light of the 30-year anniversary of the Black Monday Crash in 1987 (when the Dow lost more than 20% in "one day", we should be reminded that investor anxiety usually increases when markets get to extremes. If stock prices fall steeply, people fret about money lost, and if they move too high too fast, they worry about sudden reversals. As greed is supposed to be counterbalanced by fear, this relationship should not be surprising. But sometimes the formula breaks down and stocks become very expensive even while investors become increasingly complacent. History has shown that such periods of untethered optimism have often presaged major market corrections. Current data suggests that we are in such a period, and in the words of our current President, we may be "in the calm before the storm." But unlike earlier periods of stock market gains, the extraordinary run-up in CAPE over the past eight years has not been built on top of strong economic growth. The gains of 1996-1999 came when quarterly GDP growth averaged 4.6%, and the gains of 2003-2007 came when quarterly GDP averaged 2.96%. In contrast Between 2010 and 2017, GDP growth had averaged only 2.1% (data from Bureau of Economic Analysis). It is clear to some that the Fed has substituted itself for growth as the primary driver for stocks. Investors typically measure market anxiety by looking at the VIX index, also known as “the fear index”. This data point, calculated by the Chicago Board Options Exchange, looks at the amount of put vs. call contracts to determine sentiment about how much the markets may fluctuate over the coming 30 days. A number greater than 30 indicates high anxiety while a number less than 20 suggests that investors see little reason to lose sleep. Since 1990, the VIX has averaged 19.5 and has generally tended to move up and down with CAPE valuations. Spikes to the upside also tended to occur during periods of economic uncertainty like recessions. (The economic crisis of 2008 sent the VIX into orbit, hitting an all-time high of 59.9 in October 2008.) However, the Federal Reserve’s Quantitative Easing bond-buying program, which came online in March of 2009, may have short-circuited this fundamental relationship. Before the crisis, there was still a strong belief that stock investing entailed real risk. The period of stock stagnation of the 1970s and 1980s was still well remembered, as were the crashes of 1987, 2000, and 2008. But the existence of the Greenspan/Bernanke/Yellen “Put” (the idea that the Fed would back stop market losses), came to ease many of the anxieties on Wall Street. Over the past few years, the Fed has consistently demonstrated that it is willing to use its new tool kit in extraordinary ways. While many economists had expected the Fed to roll back its QE purchases as soon as the immediate economic crisis had passed, the program steamed at full speed through 2015, long past the point where the economy had apparently recovered. Time and again, the Fed cited fragile financial conditions as the reason it persisted, even while unemployment dropped and the stock market soared. The Fed further showcased its maternal instinct in early 2016 when a surprise 8% drop in stocks in the first two weeks of January (the worst ever start of a calendar year on Wall Street) led it to abandon its carefully laid groundwork for multiple rate hikes in 2016. As investors seem to have interpreted this as the Fed leaving the safety net firmly in place, the VIX has dropped steadily from that time. In September of this year, the VIX fell below 10. Untethered optimism can be seen most clearly by looking at the relationship between the VIX and the CAPE ratio. Over the past 27 years, this figure has averaged 1.43. But just this month, the ratio approached 3 for the first time on record, increasing 100% in just a year and a half. This means that the gap between how expensive stocks have become and how little this increase concerns investors has never been wider. But history has shown that bad things can happen after periods in which fear takes a back seat. Past performance is not indicative of future results. Created by Euro Pacific Capital from data culled from econ.yale.edu & Bloomberg. On September 1 of 2000, the S&P 500 hit 1520, very close to its (up to then) all-time peak. The 167% increase in prices over the prior five years should have raised alarm bells. It didn't. At that point, the VIX/CAPE ratio hit 1.97…a high number. In the two years after September 2000, the S&P 500 retreated 46%. Ouch. Unfortunately, the lesson wasn’t well learned. The next time the VIX/CAPE hit a high watermark was in January 2007 when it reached 2.39. At that point, the S&P 500 had hit 1438 a 71% increase from February of 2003. As they had seven years earlier, the investing public was not overly concerned. In just over two years after the VIX/CAPE had peaked the S&P 500 declined 43%. Double Ouch. For much of the next decade investors seemed to have been twice bitten and once shy. The VIX/CAPE stayed below 2 for most of that time. But after the election of 2016, the caution waned and the ratio breached 2. In the past few months, the metric has risen to record territory, hitting 2.57 in June, and 2.93 in October. These levels suggest that a record low percentage of investors are concerned by valuations that are as high as they have ever been outside of the four-year “dotcom” period. Investors may be trying to convince themselves that the outcome will be different this time around. But the only thing that is likely to be different is the Fed's ability to limit the damage. In 2000-2002, the Fed was able to cut interest rates 500 basis points (from 6% to 1%) in order to counter the effects of the imploding tech stock bubble. Seven years later, it cut rates 500 basis points (from 5% to 0) in response to the deflating housing bubble. Stocks still fell anyway, but they probably would have fallen further if the Fed hadn't been able to deliver these massive stimuli. In hindsight, investors would have been wise to move some funds out of U.S. stocks when the CAPE/VIX ratio moved into record territory. While stocks fell following those peaks, gold rose nicely. It should be clear to anyone that since the 1990s the Fed has inflated three stock market bubbles. As each of the prior two popped, the Fed inflated larger ones to mitigate the damage. The tendency to cushion the downside and to then provide enough extra liquidity to send stock prices back to new highs seems to have emboldened investors to downplay the risks and focus on the potential gains. This has been particularly true given that the Fed’s low interest rate policies have caused traditionally conservative bond investors to seek higher returns in stocks. Without the Fed’s safety net, many of these investors perhaps would not be willing to walk this high wire. But investors may be over-estimating the Fed's ability to blow up another bubble if the current one pops. Since this one is so large, the amount of stimulus required to inflate a larger one may produce the monetary equivalent of an overdose. It may be impossible to revive the markets without killing the dollar in the process. The currency crisis the Fed might unleash might prove more destructive to the economy than the repeat financial crisis it's hoping to avoid. We believe the writing is clearly on the wall and all investors need do is read it. It’s not written in Sanskrit or Hieroglyphics, but about as plainly as the gods of finance can make it. Should the current mother-of-all bubbles pop, for investors and the Fed it won’t be third time’s the charm, but three strikes and you’re out. Gold has largely been drifting sideways for the better part of a couple months now, sapping enthusiasm. Gold investment demand has stalled due to extreme stock-market euphoria. Investors aren’t interested in alternative investments led by gold when stocks seemingly do nothing but rally indefinitely. But once stock-market volatility inevitably returns, so will gold investment demand which fuels major gold uplegs. Overall world gold demand was quite weak in Q3, dropping 8.6% YoY to 915.0 metric tons. That made for an 86.1t absolute drop. Investment demand, though it only accounted for just over a quarter of the total, was responsible for this entire demand decline. Gold investment demand plunged 27.9% YoY in Q3, or 93.4t! The WGC further breaks down that category into bar-and-coin demand and ETF demand. They attempt to understand today’s gold’s price action in historical pre-gold-ETF-era terms. 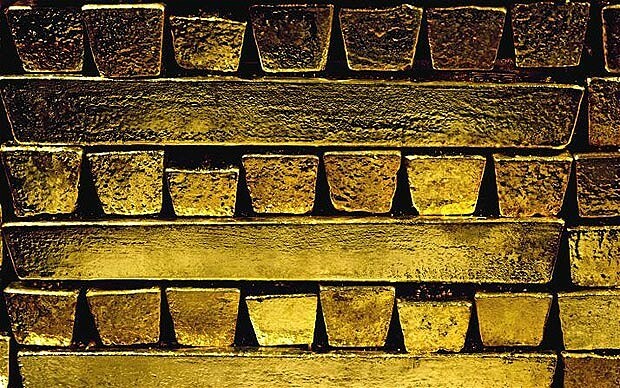 But for better or for worse, the gold world is radically different now. GLD, and to a lesser extent the other large gold ETFs trading in foreign stock markets, changed everything. Gold investors ignoring GLD’s holdings are flying blind. While the stock markets haven’t rocketed vertical in a mania, there’s no doubt euphoria is extreme. Investors feel happy and confident about stocks after this past year’s incredible Trumphoria rally. Polls now universally show investors are the most confident stocks will keep rallying over the next year since 2000, a bubble peak! Make no mistake, gold investment demand will explode again and drive gold sharply higher when today’s lofty hyper-complacent bubble-valued stock markets inevitably roll over again. Leading into Q1’16 the SPX corrections were only 12.4% and 13.3%, not serious. Corrections can grow as big as 20% before they become new bear markets. Imagine what an SPX selloff around 20% would do for gold investment demand. The physical decay of the Palace of Westminster is more than a metaphor. Like the culture and conventions inside, the building’s failings contribute to the problems of running a respected 21st-century democracy. Scaffolding obscures the view of Big Ben, the world’s most famous clock, its bongs silenced to allow repair. In the subterranean dining rooms, carpets reek from years of spilled alcohol, and one MP memorably tweeted that urine was leaking through his office ceiling (from toilets, not another member’s office, he later clarified). Contractors peer at the wiring wondering what they can safely patch up — and if they win the tender for the great renovation, whether it will prove a poisoned chalice. Yet MPs duck a decision on repairs, fearing that public opinion will damn them for the costs if work is done while they are still in residence, or prevent them returning if they decamp. The culture is the greater problem, though. It is hard to get a better illustration of how it needs to change than Michael Fallon’s assertion on resigning that “what might have been acceptable 15, 10 years ago is clearly not acceptable now”. As the former defence secretary would have it, he was wrongfooted by the passage of a few years — not that he was wrong back then. Even more tone deaf was his remark that his inappropriate advances to women had “fallen below the high standards that we require of the armed forces”. Not those of Westminster. Revelations about Harvey Weinstein, the predatory Hollywood producer, have triggered a cascade of accusations of sexual harassment in parliament. The firestorm, fanned by the fragility of the government and fractures in the main political parties, is driven too by MPs’ own impatient fear that something needs fixing if they are to have a chance of countering public contempt. With a new taste for Twitter and referendums, many voters seem to be questioning the value of a representative in parliament. What should be done? For a start, this latest round of sleaze shows how odd it is that MPs’ offices are like mini fiefdoms, with members employing their staff directly. MPs are the main recourse for complaints — but what if the complaint is about the MP? Recent weeks show that parties cannot be the ultimate regulators of MPs’ behaviour. They want to preserve the reputation of their MPs and will have every temptation, as recent stories suggest, to tell aggrieved staff with a complaint to shut up if they want a career. Theresa May is right to call for a new independent regulator. The Independent Parliamentary Standards Authority, created in 2010 after the expenses scandal, covers only pay and expenses. That earlier scandal has made it impossible to debate whether MPs should be paid more, or whether members of select committees, as well as the chair, should be paid for that work: a pity. The strains, risks and sheer career uncertainty of being an MP have rarely been greater. How they are to be compensated needs discussion. Select committees, whose healthy contribution to the scrutiny of government and legislation is growing, depend on MPs putting in time to master specialist areas. In general, the parties have been poor defenders of their MPs, at a time when being a politician is ferociously tough. They have been slow to clamp down on abuse and threats — which can, as the murder of Jo Cox appallingly showed, be lethal. But the problems go deeper than MPs’ behaviour and conditions of work. Parliament is faltering in its basic job of holding the government to account, passing well thought out legislation, and doing so in a way that commands public trust. Brexit has squeezed out almost all other legislation from the timetable. A minority government’s struggles to survive mean that much debate is stalled or simply avoided. The general election result this year gave an entirely misleading picture of the health of the two main parties; the rifts within them are deep — over region, generation and wealth, as well as Brexit. They are barely functioning within Westminster as conventional parties, and voters have every reason for struggling to see their own concerns reflected there. It would not be surprising if the question of changing the voting system reared up again. Above all, the EU referendum set up a clash between the people’s vote and their representatives in parliament. True, some things have improved. There are far more women MPs, and more younger ones. John Bercow, Commons speaker, encourages more backbenchers to speak. The committees are stronger and — almost — offer a satisfying career outside government. The whips are correspondingly less powerful. Portcullis House offers modern, secure offices for some MPs. Most of all, there is some attempt at reform. Mrs May has tried to press ahead with the boundary review, cutting the number of MPs from 650 to about 600, but while she may be too weak to get it through, the principle is right. Even more worthwhile is the proposal to cut the number of peers in the Lords from around 800 to about 600 and to limit terms to 15 years is sensible. These steps will not on their own repair trust. Public distaste for Westminster has deep roots. The financial crash a decade ago, and the expenses scandal, bear much blame; but voters resent many of the messages that politicians feel obliged to deliver, such as the constraints on spending. Meanwhile, MPs are braced for Brexit to disappoint even those who voted for it. People are angry, and have got used to saying so. Those are issues with which the UK has grappled for years. But the fury about sexual harassment promises to achieve what those debates failed to — forcing a change in how Westminster runs itself. In theory at least, that should be quicker and cheaper than repairing eight acres of a gothic revival building on the banks of the Thames.